The advance design technology adds value to the manufacturing facility and help to provide punctual and precise desired outcome. Our ultramodern fabrication facilities strengthen our abilities to provide world class solution. We make use of the high grade aluminium profiles and connectors. l to fabricate the Aluminium Profile Workbench. To save transportation and shipping cost our Aluminium Profile Workbench are packed and sent with proper dismantle manner with easy instruction manuals. Our Aluminium Profile frame systems are very easy and simple to arrange fast as the desired configurations. It is the quick and simple to reconfigure our Aluminium Profile frame systems and support your lean manufacturing system. It helps to remove waste and obstructions. It helps to improve the quality of the system and also cut costs, which decrease overall price of the system. According to lean manufacturing systems, one can rearrange or modify the Aluminium Profile frame systems as per required. So our systems efficiently provide the sturdy load bearing capacity and offer complete reimbursement of their investment. We provide wide range of Aluminium Profile frame systems to cater the requirements of various industrial sectors. It is efficiently perform as ideal solution for the need of the standard regular work stations and also for the special workbenches. Our Aluminium Profile frame systems are suitable all kind of working environments. 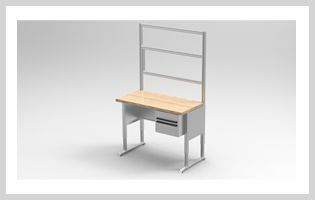 You may add the extra accessories like keyboard tray, adjustable shelves, drawer cabinet, monitor arm, computer shelf, power boards, light, perforation panels with hooks, parts containers, plastic bins and other accessories you need.The cad drawing of Aluminium Profile Workstations or workbenches are approved before fabrication. Dismantle Packing Saves Transportation and Shipping Cost.